Once when I was a kid living on the farm in Waco, KY, my father and I saw a huge red glowing ball streak down through the sky and disappear on the forested horizon. It made an audible crash, and a red glow momentarily rose the spot. I've always wondered about that fireball from the sky, and a few years ago I decided to go poking around in the general vicinity that it appeared to have landed. 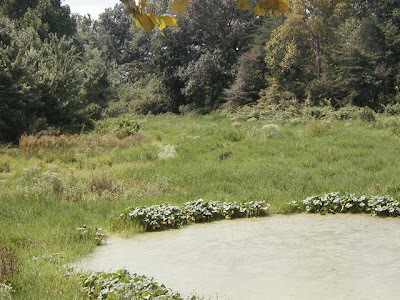 I came upon this round pond that seemed uncannily like an impact crater. Unfortunately, the next time I came to the site to investigate further, construction work for homes had begun and obliterated the evidence. There's a small isolated piece of Kentucky that isn't actually connected to the rest of the state ("exclaves", geographers call such things) known as "Kentucky Bend", or more colorfully, "Bubbleland". 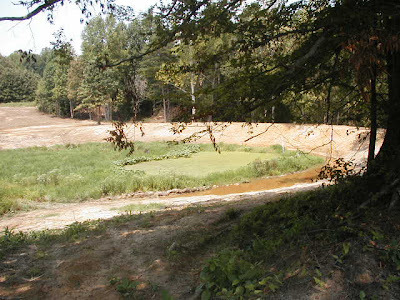 The exclave was created due to the shift in course of the Mississippi after the New Madrid Earthquakes in 1811 and 1812. Mark Twain, in Life on the Mississippi, wrote about the feud between the Darnell and Watson families in Bubbleland, one that lasted six decades! No Unusual Kentucky updates in a week?? Well, I've not had much time as of late. I've been in superserious crunch time with my play Toulouse-inations, which makes its world debut tomorrow night at 8pm at the Kentucky Center for the Performing Arts in downtown Louisville. The show is pretty damn weird in itself, in more ways than one, so go and check it out even if you think theatre's not your bag. After its run in Louisville, the show will go on to play in other cities and will set its sights on an Off-Off-Broadway production in NYC in 2009. By sheer persistence, stubbornness, and plugging away, this play will eke out a reputation for itself, for better or for worse, by hook or by crook, a bis ou a blanc. Someday you'll kick yourself for not having jumped on this chance to see the show in its very first raw incarnation with its original cast, so save your future self the anguish of hindsight, and purchase tickets NOW! 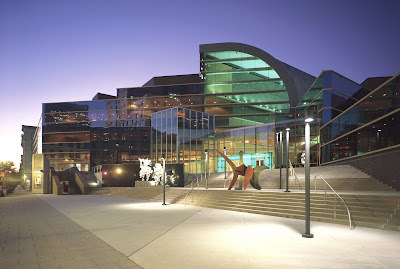 Consult the Kentucky Center's schedule here to peruse and purchase. The show opens August 7 and runs for FOUR DAYS ONLY. Questions? Call the Kentucky Center at 502.562.0100 or Catclaw Theatre Company at 502.649.3378.